Overall, 78% of registered voters who support Trump for president say their spouse or partner also intends to vote for Trump, while just 3% say their partner is planning to vote for Clinton. The numbers are almost identical among Clinton supporters: 77% say their partner also backs Clinton, compared with just 3% who say their partner is supporting Trump. Comparable shares of both candidates’ supporters– 15% of those who favor Trump and 14% who back Clinton– say they do not know the voting preferences of their spouse or partner. The new survey was conducted online September 27 to October 10 on the nationally representative American Trends Panel of 3,616 registered voters, including 2,405 voters who are either married or living with a partner. It was largely completed before the release of a videotape from 2005 showing Trump making lewd comments about women. The survey finds that a large majority of voters (78%) say they talk about politics with their spouse or partner at least somewhat often, with 44% saying the topic comes up very often. Half of Trump supporters and 45% of Clinton supporters say politics comes up very often in conversation with their significant other. Voters who support Libertarian Gary Johnson for president are far less likely than Trump or Clinton voters to talk politics with their spouse or partner, and are less likely to know how their spouse is voting next month. Just 18% of Johnson supporters say they talk about politics very often with their spouse or partner. 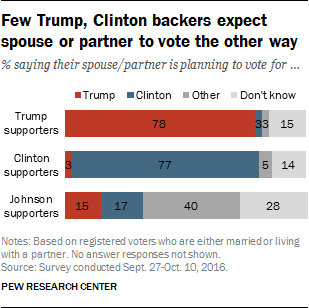 While 32% of Johnson supporters say their partner is voting for either Trump (15%) or Clinton (17%), four-in-ten say he or she prefers another candidate, while 28% say they do not know how their partner is voting. As with overall interest and engagement in politics, there are sizable age differences in how frequently politics comes up in conversation among couples. Only about a quarter of those younger than 30 (24%) say politics comes up very often in conversation, the lowest share of any age category. Among voters 65 and older, 63% say they talk about politics with their spouse or partner very often. Given the broad agreement in voting preferences among those in relationships, it is not surprising that relatively few voters report arguing with their spouse or partner about the election. 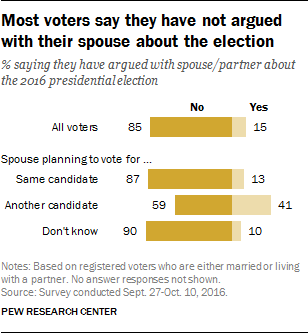 Among all registered voters, 85% say they have not argued about the election with their spouse or partner, while just 15% have. But arguments are more common among the 11% of voters who say their spouse or partner will vote for a different candidate. About four-in-ten of these voters (41%) say they’ve had an argument about the election, compared with 13% of those whose partner plans to support the same candidate and 10% of those who do not know their partner’s plan. Nearly nine-in-ten men who back Clinton (89%) say their spouse or partner also supports Clinton. By contrast, only about two-thirds (68%) of women who support Clinton say their partner is also planning to vote for her. In part this is because women who support Clinton are more likely than men who support her to say they do not know who their partner will support (18% vs. 9%). Among Trump supporters, the pattern is reversed, if somewhat less pronounced. A greater share of women than men (83% vs. 74%) say their partner or spouse also supports Trump. These differences may largely reflect the overall gender gap in support for the two candidates.1 For instance, among all voters who are married or living with a partner in the current survey and support Clinton, 56% are women while 44% are men. Conversely, 56% of married or partnered Trump supporters are men, while 44% are women. The presidential election also is a topic of discussion for parents and children, especially those in their teens. Among parents or guardians of children under 18, 11% say the election comes up very often with their children, while about three-in-ten (29%) say they talk about it somewhat often; 60% say the subject comes up not too often or not at all often. Most voters with teenage children say they talk about the election with their children somewhat often (44%) or very often (20%). Parents of younger children talk about the election with their children much less often. 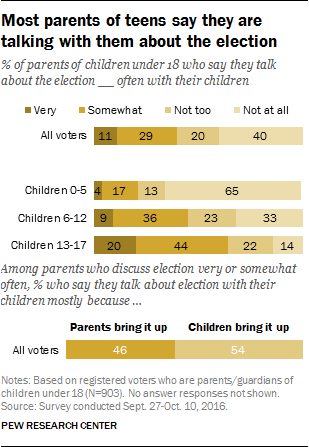 Parents and children bring the election up in conversation at nearly the same rate. About half (54%) of the parents who said they talk about the election at least somewhat often with their children say they mostly discuss it because their children bring it up. About as many (46%) say they mostly bring it up in conversation. The share that says their children mostly bring it up does not vary depending on the ages of the children.